Uplighting has become the Gold Standard of event lighting. Lights are placed around a room or outside, and light is aimed up at a wall. It creates atmosphere where none previously existed, and can completely transform a room. Our uplights are smaller and brighter than most, and are wireless, battery-powered, intelligent, and connected. That means your event can start bathed in any color you choose, and when the music starts playing the lights can work together to transform any space into anything you can imagine--from a psychedelic rave to a cool jazz club. There are no limits to what we can do. Pinspots are an elegant way to add dramatic lighting to your event. Using our small, wireless, LED lights, we can accent any feature of your event that you desire--even your guests. Unlike other pinspots that are only white, ours are able to recreate any color you can imagine. For example, white floral centerpieces can be cast aglow to appear purple--and can turn blue automatically. While you may enjoy them in white, you are no longer limited. We are one of a few vendors in the country that can offer this color-changing service. Projection Mapping is an exciting new technology that allows us to project specific areas of video or images on any surface--including cakes. Can't decide on what your cake should look like? Unsure of a backdrop for your presentations? Have us create some video for you, and have them projected on the surfaces instead. You'l save money on expensive decoration and set piece printing, and your guests will be amazed. Check out this video that shows projection we recently did on a cake. A gobo is the name for a metal or glass disc that goes inside a special light to create any number of patterns or images on a surface. The only difference between a gobo projection and logo or monogram is the gobo itself. Instead of projecting a name or logo, we can project textures, shapes, colors, stripes or any combination of the above. It allows us to place patterns on solid surfaces and provide a dramatic change to an otherwise neutral surface. We also offer video and animated gobos. Imagine your name being gracefully written in light across the wall. If you can dream it, we can do it. When standard lighting just won't do, we offer special effects. Some of our more popular choices are: Lasers, Water Effects, & Haze...but there are several options. This type of lighting is often seen in nightclubs and concerts, but can be added to any event. We offer many types of effects, and are always adding more. Contact Us with any questions about how we can create the space of your dreams. In the past, stage lighting was a long and tedious process to install, program, and break down. With our wireless lighting system, we can have a concert or DJ booth ready-to-light before the first sound check. Because our lights are small, bright, wireless, battery-powered, and intelligent, we can turn any area into a concert space--even vacant lots. No party is complete without a dance floor. 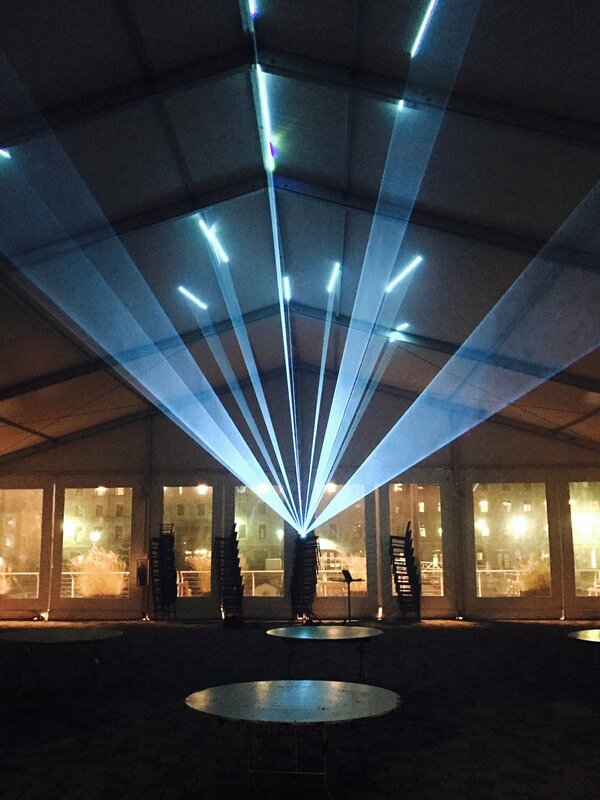 Using our wireless lighting we can create a dance floor where you never thought possible--even outdoors. When there is power nearby, we can really crank up the light and have any number of effects rivaling the best nightclubs. Tell your band or DJ to leave the work to us--we can make our lights match their music. They can be fast and flashy for high-energy songs, and mellow and elegant for slow jams--instantly. Centerpieces, while often beautiful, sometimes lose their place when dinner is done and guests hit the dance floor. Consider allowing us to design lighted centerpieces for you that can react to your evening by changing color to match music, or to punch up the bidding of an auction. It's proven that changing light colors at event can increase spending, increase dancing, and even increase appetite. Of course, it can decrease these things too should you desire. Using our signature AX3 wireless light, we are able to create many different types of hanging lanterns. In fact, as long as there is an opening of 3.5", most anything can be illuminated. We have a variety of hanging methods, but our most popular method is our magnetic hanging system that allows us the ability to easily reposition the element from the ground, saving time and labor. In addition, the hanging lights can be white or any color you can imagine throughout the night. Since our lights are wireless, they can be hung from anywhere. Lasers have come a long way since the green lines and dots of the 1980s. Our lasers are able to produce thousands of colors and create amazing animations and graphics. 'Liquid Skies" of color can be projected out to your audience in various constantly changing shapes and sizes, and can simultaneously show any number of custom shapes and graphicc. Advertising with lasers is quite easy and surprisingly affordable. Using your supplied artwork or ours, we able to create a laser animation that can be projected onto any number of surfaces, and be over 100 ft high by 100 ft wide. Because of the brightness of our lasers, your graphics will be visible from very far away, and in some cases will be seen clearly in broad daylight. Our lasers are able to be used in any type of environment, indoors or out. We can fill multilple-thousand-capacity spaces or light buildings from hundreds of feet away. Power requirements are minimal and using a wireless network, the entire installation can be remotely managed without the need for running hundreds of feet of cable to a remote board. Light is beautiful, but paired with sound it's breathtaking. We work with a variety of performers and sound engineers that can help please your ears while we handle the eyes. We will help you decide which performer or engineer will best suit your event and environment, and handle all of the details so you can just show up and have fun. One contract, one invoice, one payment. Done. Please visit the websites of our partners and contact us for more information!